Time to go back to the old school again. And it seemed sensible to catch-up with a Champions League winner given that the big day has arrived. THEN: David May was a centre-back – one of those English centre-backs that Alex Ferguson can see something in but the rest of us (including the England national team manager) cannot. He had his footballing education at Blackburn Rovers, but after six years at Ewood Park he was signed by Man Yoo for Â£1.2 million in July 1994 (just in time to miss Blackburn beating United to the title the following season). He became more prominent as the Steve Bruce-Gary Pallister partnership came to an end, and was a first-team regular in the 1996-97 season. 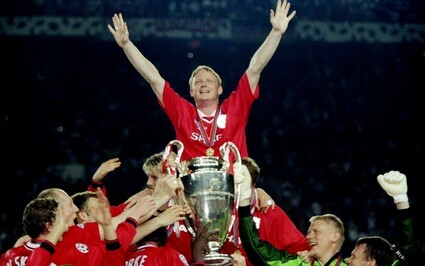 Injuries and new signings limited his chances, but he was named on the bench for United’s 1999 Champions League victory over Bayern Munich. He earned cult status among United fans for hogging the limelight during the celebrations. NOW: After dropping into non-league football to play for Bacup Borough, May hung up his boots to concentrate on his wine importing business which he set-up with a South African restaurateur. The company’s Mayson Ridge range (see below) is named in his honour. He has also become a cult hero (again) for some reason. A bunch of Norwegians (is that the correct collective noun? A forest of Norwegians?) have created a popular Facebook group called Next time I’m getting my haircut, I’m getting a David May.